Birds? Hey, where are the pictures of doors we have all learned to love so very much? Don’t you think this might be too radical to suit the tastes of your fans? I dont get it, but then of course, i have never seen twitter before ether, so that may be the problem. i generally try to avoid the Social Circle websites. other than Here and /. and a few other places of total importance. The idea of Twitter by and large seems to be broadcasting what you’re doing at any given moment of the day. At least as I understand it, I don’t use it myself either since I generally dislike most of the social networking sites out there. Well, there’s only one post everyone should ever post to twitter – “I’m posting to twitter” – and get done with it already. I see more point in talking to a volley ball. Reusable code, it’s a feature! First, there was a Door. Then, there was a Bird. Following Jeff Atwood (www.codinghorror.com), Brent Simmons, Joshua Allen, John Gruber, etc. 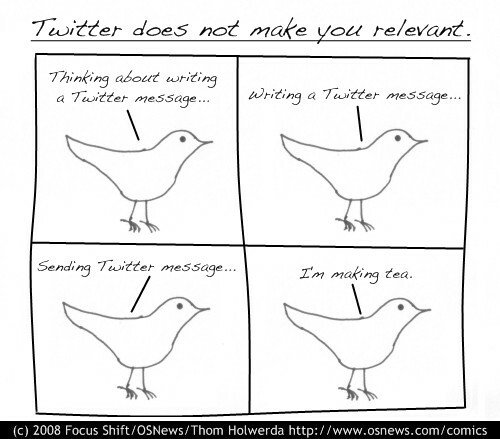 on Twitter is interesting and “has nothing to do with Social Networks”. Yeah, I guess that’d work too. But following a few tweets is ok; what is *not* ok, is: following tweeters AND playing World of Warcraft.